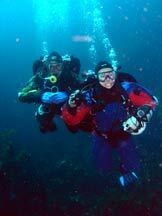 We dove the Poor Knights and experienced one of Jacques Cousteau's favorite places. The islands are uninhabited by man and feature the native Weta grasshopper, the heaviest insect in the world. 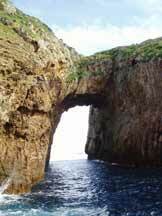 The islands feature sheer cliffs, large cavernous sea caves and huge natural arches. Topside was almost as interesting as the diving. Almost. 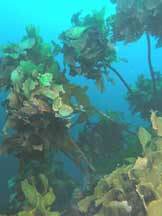 This is kelp country and the ever-present surge plays tricks on your perception. You would swear the giant rocks are moving, waving their kelp forests. Indeed, it takes effort and concentration to understand that the surge moving the kelp is moving you too, even if imperceptibly. We found nudibranchs and even a massive sea hare. Picture a nudibranch a foot long and 4 inches wide, munching on kelp. Just amazing. There was no current, but working the surge easily took some technique. Swim when it's going your way. Streamline when it's against you. A fun ride! The Poor Knights Islands are small, but their birds-eye view almost looks like a tiny version of New Zealand itself. They are 2 islands, laying North and South. 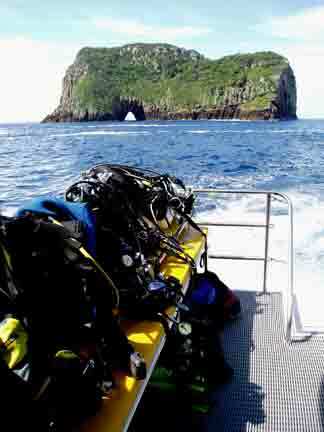 Both islands provide beautiful dive sites along their sides, and edges. There are a variety of things to see here. The water is colder, about 70F, and some sites are a bit deeper with 70 feet being an average, but the feeling of hanging above a moving bed of grasses, tree-like shrubs of kelp is intoxicating! The islands are gorgeous, and we were lucky to have great weather on our tour. 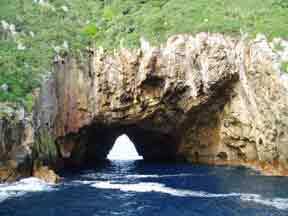 The boat was able to back up into a couple caves, where the obligatory chant was had. We rode through a few amazing rocky arches, using our surface interval wisely. More Digital and Film Pix Coming Soon.